The first book I read by Michael Crummey was the weird and wonderful Galore, and I loved it. So, when I went into a used book store one day and saw both The Wreckage and River Thieves, I snatched them up. 1. I love the picture on the cover of the book. I have since discovered, however, that the picture on the cover doesn’t really go with the story. I love reading books that take place during the war (any war really). It’s a fun way to learn about them. When I used to volunteer frequently at my kids’ school library, I would see on the shelf many perfect copies of this book. I don’t know why they had so many copies that looked as though no one had ever touched them, but I longed to bring one home and read it. But I wasn’t allowed, and my children were too young to check it out for me. So, The Wreckage was the second Michael Crummey book I read. I really liked this one too, but it was a lot darker than I thought it was going to be. I’ve been wanting to finish all three books. I’m curious to know which one I will like the best. Therefore, when it came time to choose my C-book I decided that this was my chance. River Thieves sounds like it might be a little more like Galore. As well, Michael Crummey has written about the Beothuk in this book which might be interesting after having just read The Orenda (about the Huron Nation and the Iroquois). 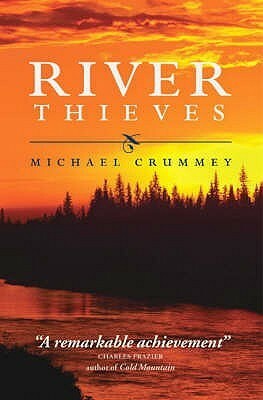 River Thieves also has a very pretty cover. *River Thieves (2001) was the winner of the Thomas Head Raddall Award, the Winterset Award, and the Atlantic Independent Bookseller’s Choice Award. It was shortlisted for the Giller Prize, the Commonwealth Writers’ Prize, and the Books in Canada First Novel Award.